The Icelandic Met Office is forecasting deteriorating weather in North Iceland as of Friday afternoon with dismal conditions on Saturday. Winter is expected to arrive with a bang in the mountains with an equally harsh snowstorm as hit the region in mid-September 2012. To prevent a similar disaster from occurring as last year when thousands of sheep were trapped and killed in mountain pastures, farmers in some areas in North Iceland have decided to round up their livestock earlier than planned. “We contacted North Iceland’s chief of police who spoke with the representative of farmers. People have been discussing whether there is reason for early roundups. However, many farmers are still busy with haymaking and the forecast can still change,” said Víðir Reynisson, director of the Civil Protection Department. The Civil Protection Department is on the alert because of the impact the weather may have on the approximately 300,000 sheep in North Iceland, most of which are roaming mountain pastures, and not least on travelers in the region. “If nothing changes we must contact tourism operators and make sure that everyone has been warned. Some tourists were cycling in the highlands when the snowstorm hit in September last year,” said Víðir." And we are having some record heat here in Saskatchewan, with highs being about 10 degrees Celsius above normal. The anticipated Iceland blizzard seen on Satellite. Forecasted Highs and Lows in Iceland. They expect snow to fall down to 150 metres. So the inland regions will have highs of 3c. There is a cold front connected to the low pressure coming through which will give us 5c min. 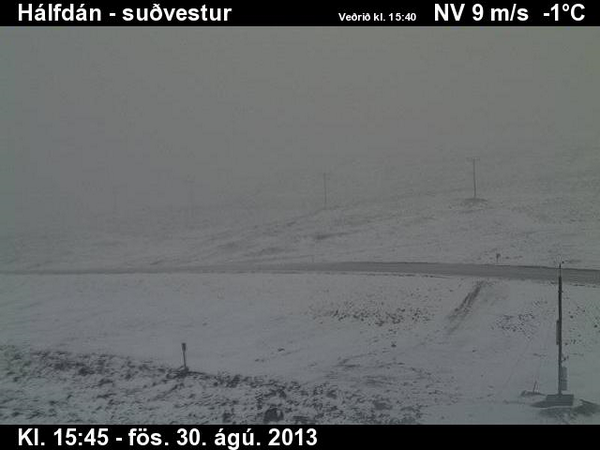 Snow tomorrow above 1200m in scotland. any webcams of inner iceland? Be cool to find them. The Icelandic Met Office is still forecasting a storm to hit the country today in the afternoon with snowfall in altitudes above 200-300 meters in North Iceland. Farmers in the region have tried to round up their sheep in time to prevent a similar disaster from happening as in mid-September last year when thousands of sheep were killed in an early blizzard that struck mountain pastures.